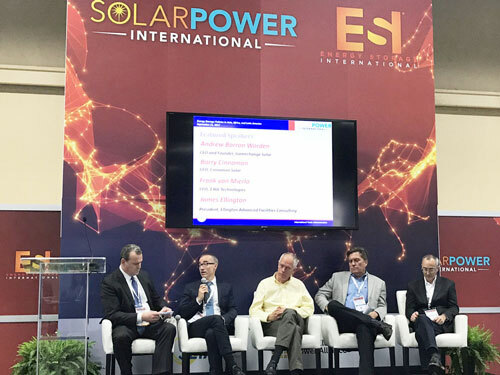 NEW YORK, NEW YORK – September 14, 2017 – GameChange Solar CEO, Andrew Worden participated in the roundtable panel session at SPI which focused on the ITC 201 case and how the Trump administration’s policy changes can impact US solar manufacturing. Passage of ITC 201 could trigger the loss of 88,000 or more of the 374,000 American jobs in the industry. The total amount of American Steel GameChange Solar provides to its customers will reach close to 300 million pounds this year and the manufacturing companies supporting the GameChange supply chain have over 44,000 employees with 2,950 in the solar sector. GameChange is committed to joining the fight against ITC 201 to protect American manufacturing and save solar jobs and it has also been profiled in SEIA's case study "Profiles in American Solar Manufacturing".